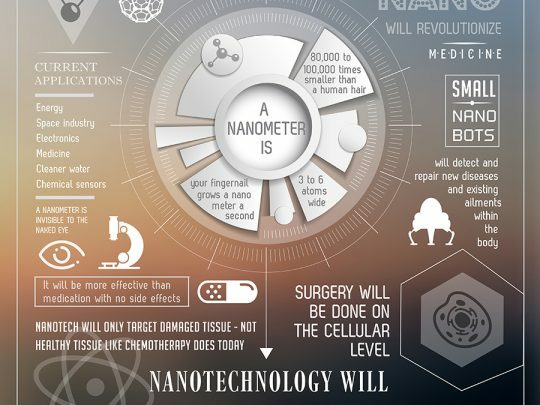 IMAGE - This medical nanorobot concept piece predicts how a future nanorobot will be built and how it will prevent and repair the human body of illnesses and protect against aging. 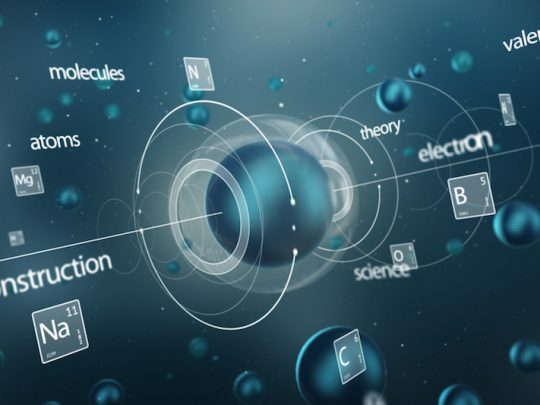 Nanorobotics is an emerging field of nanotechnology which constructs devices out of individual atoms. 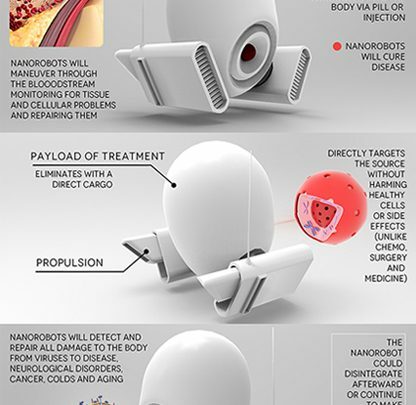 Medical nanorobots could be programmed to diagnosis and treat various diseases. They will carry medicine or treatment directly to the targeted disease and perform surgery on the cellular level eliminating the need for external medication or treatments and their resulting side effects. They could be injected into the body and disintegrate after repairing the damage or they could continuously monitor from within the body detecting problems as they emerge and removing damaged cells or the defected portion of the cell so that one is never sick and perhaps never ages. This image has been cropped, click the details button to view the full image. This image is available as a poster. IMAGE - Infographics visually represent information in a simple form so that it is quick and easy to understand. 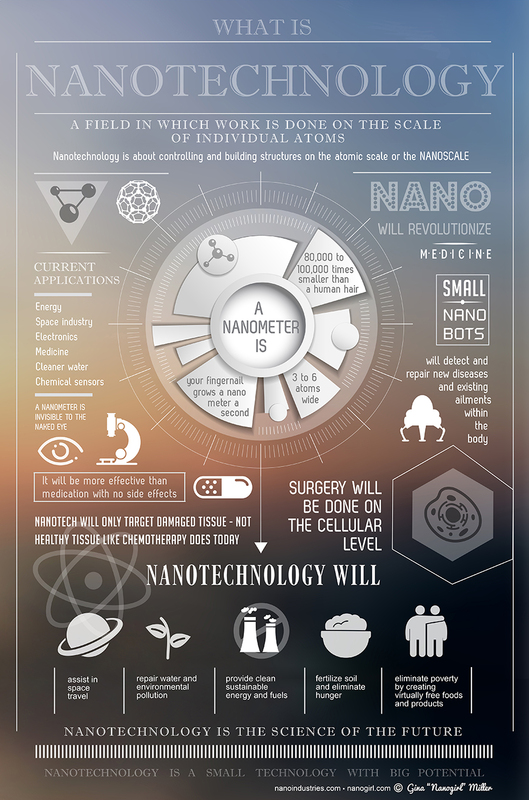 This Nano Infographic explains what nanotechnology is, what the current and future applications are and how it will positively impact society. This image has been cropped, click the details button to view the full image. This image is available as a poster. 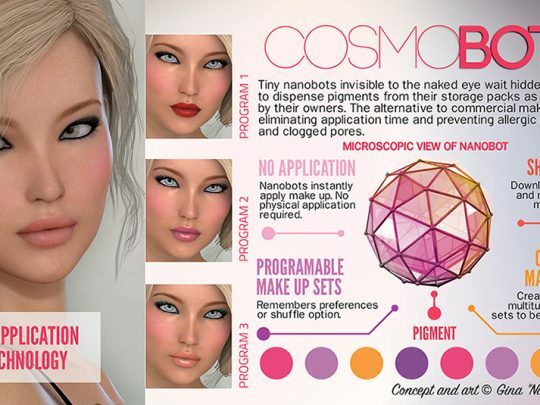 IMAGE - Cosmobots are a future nanotechnology concept by Gina “Nanogirl” Miller. 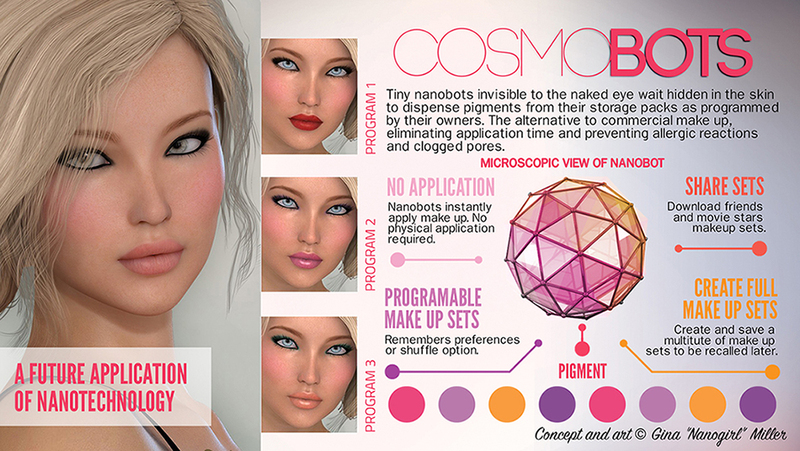 Small pigment filled nanorobots would arrange themselves on the skin in predesigned make up pallets. Set’s could be created and updated by users and shared with others. Because the make up is only skin pigment and not a product there would be no application or removal required and no negative skin reactions. This image has been cropped, click the details button to view the full image. 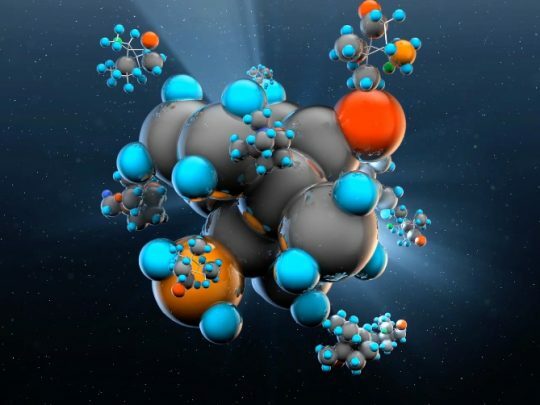 VIDEO - Nanotube TV: Introduction to Nanotechnology. 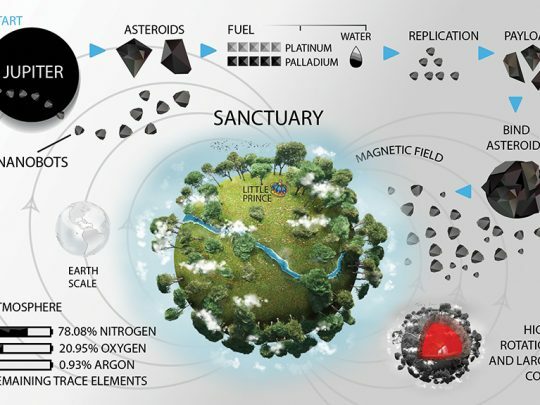 Movie by Gina “Nanogirl” Miller with James B. Lewis PhD explaining in an easy to understand, beautifully illustrated short film what nanotechnology is, in what areas of our lives it could impact us and why it is so important. There may be pre-purchase opportunities for continuing episodes and/or subscription options, check back later to keep up to date. Click the detail button to watch the video. 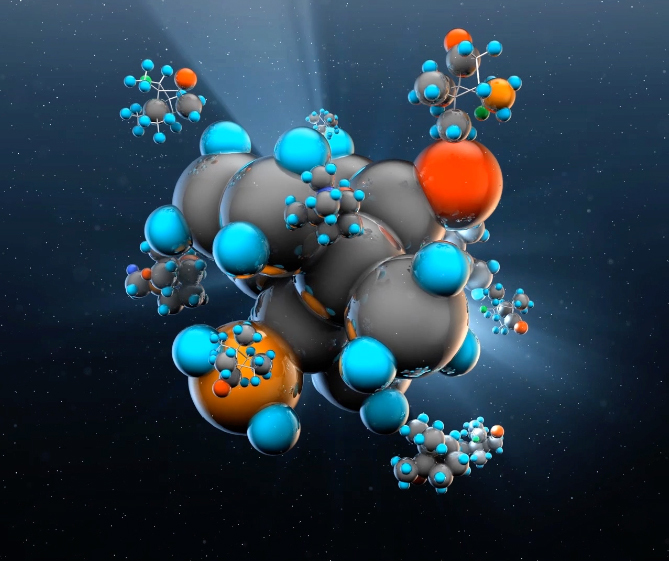 VIDEO - Based on a concept from the book Nanomedicine, Volume I: Basic Capabilities by Robert A. 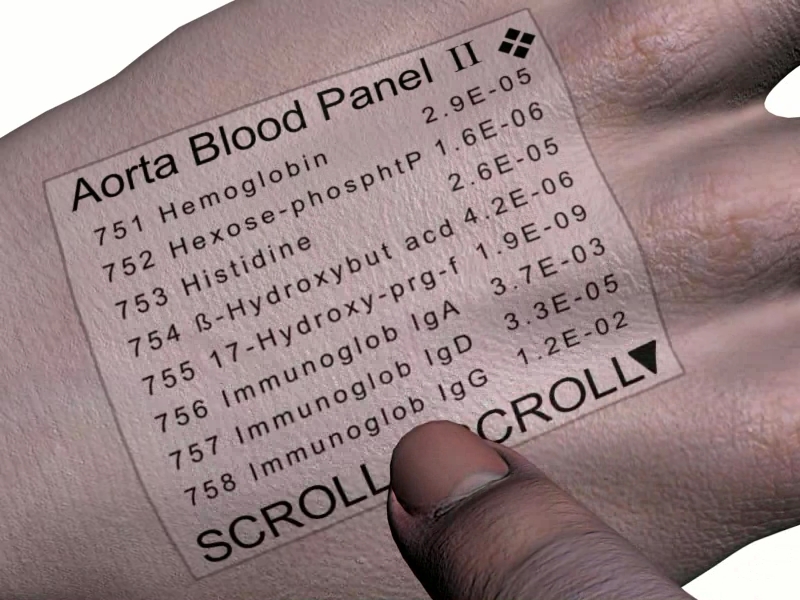 VIDEO - Based on a concept from the book Nanomedicine, Volume I: Basic Capabilities by Robert A. Freitas Jr. who describes a "programmable dermal display" in which a population of about 3 billion display pixel robots would be permanently implanted a fraction of a mm under the surface of the skin, covering a rectangle 6 cm x 5 cm on the back of the hand. Photons emitted by these pixel bots would produce an image on the surface of the skin. This pixelbot array could be programmed to form any of many thousands of displays. Each display would be capable of two functions: (1) presenting to the user data received from the large population of medical bots that roam the user's body; (2) conveying instructions from the user to that same large population of bots. The display could be activated or deactivated by finger tapping on the skin. This 3-minute animation illustrates the motions and live interaction of these display screens. Click the detail button to watch the video. 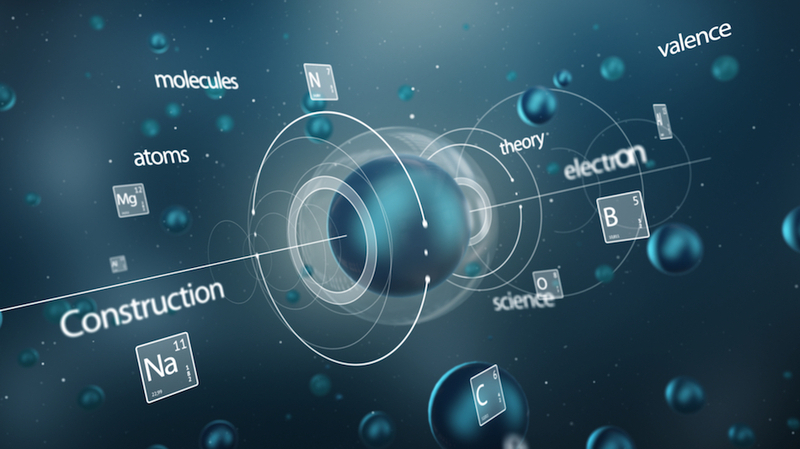 VIDEO - A nanotechnology company overview video. 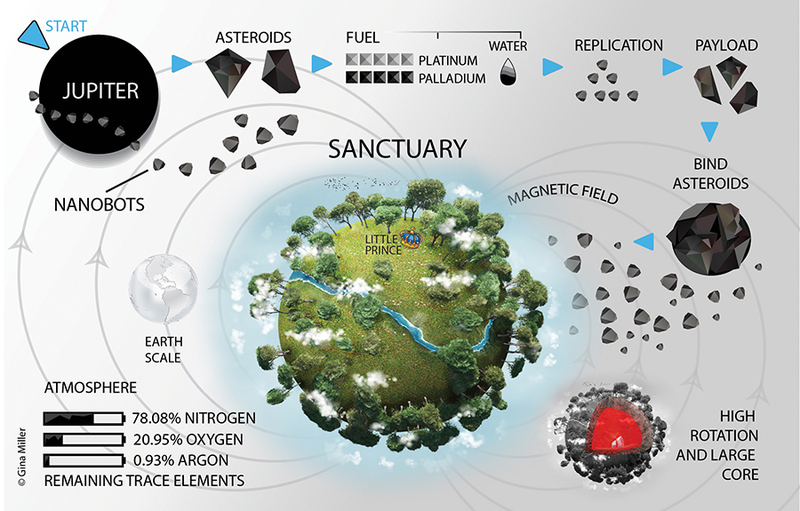 IMAGE -This image is the companion artwork for the "How to Build a Planet Using Nanotechnology (Sanctuary)"
IMAGE -This image is the companion artwork for the "How to Build a Planet Using Nanotechnology (Sanctuary)" paper. This image is available as a poster.